His widow lays out possible scenarios, from divorce to open marriage, on the 18th annniversary of his death. It’s been 18 years since Nirvana frontman Kurt Cobain took his own life in the greenhouse of his Seattle home, and the passage of time has done little to quiet fans’ questions and theories about what might have been had Cobain not died April 5, 1994 at the age of 27. Would a by-that-point fractured Nirvana have managed to stay together? 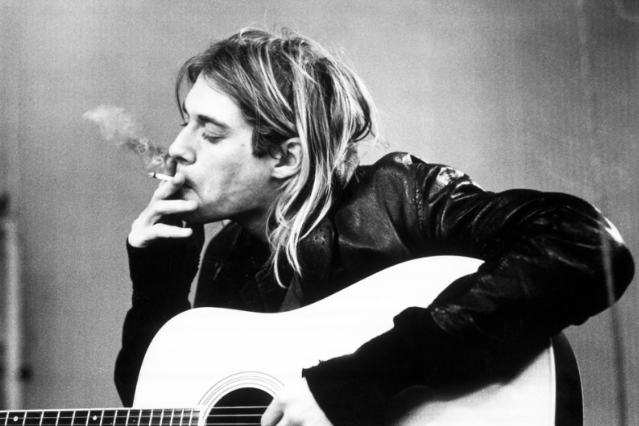 Would Cobain have pursued a quieter solo career? Would the Foo Fighters even exist? (Just recently, the screenwriter for Clint Eastwood’s upcoming remake of A Star Is Born revealed that he’d partly based his screenplay on the concept of a 50-something Cobain who “was past his prime and no longer someone.”) And what of Cobain’s volatile marriage to Hole’s Courtney Love? Would it have, as many have posited, ended in divorce? Or would the couple have made it work? • What Nevermind Means to Me: Eddie Vedder, Wayne Coyne, Dave Grohl and more share their personal histories with Nirvana’s landmark album. • Kurt Cobain Scrapbook: Images of Kurt through the years, as we ran them in the pages of SPIN. • Eight Myths About Nevermind: Cobain biographer Charles R. Cross answers two decades of burning questions.